Here is a small gift to you: Receipe on how to be creative when you don´t have much time for it. A Creative quickie is a small exercise I invented when I was a new mama to child No. 2, and child No. 1 suffered from a nasty child eczema. My time and energy to be creative was drastically cut down, but the ideas kept coming and I was very frustrated not to have the opportunity to act on them. And that did not help my children. Perhaps you are in a situation in your life right now, where the energy and time to be creative is not quite as you could wish? Or maybe you just want to learn a nice little exercise that can make even the most stiffened creative juices gently flowing again? If you have just 5 to 10 minutes, you can make a Creative Quickie like the one you see above. It is a kind of Creativity medicine, recommended in small daily doses. Diminishes frustration about no time to be creative, and opens strengthen inspiration and action. You will need: a magazine, a piece of white paper, a glue stick, a marker and the will to risk being embarrassing / crazy / too much. 1. Browse a magazine or anything you have with pictures in, that it is OK to cut in and rip out 1 – 3 images that for some reason speak to you. Dont´t try to understand why, just tear them out! 2. Glue them randomly on a blank piece of paper, using a glue stick. I use a notebook without lines, but it could just be any blank piece of paper. 3. Take a deep breath, then write whatever words come to your mind. Can be one word, or several sentences. If you wish, add some doodling. Any writing tool will work, but I love to use a permanent marker so I can also write on the glossy magazine pics. Allow yourself to be a little silly/bold. Enjoy the freedom: no one has to see this, it´s just for you! That´s it! 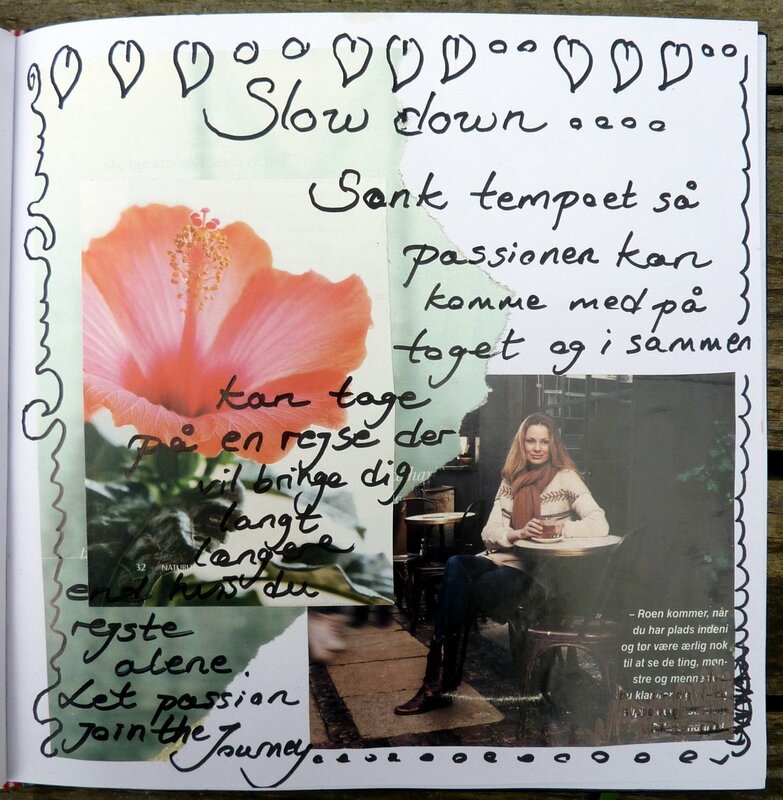 This way you can create your own little “dream-carrier- pages” and know that in just 10 minutes you have both been creative AND kept your bigger creative dreams alive until one day you will have more undisturbed time and energy to act on them.